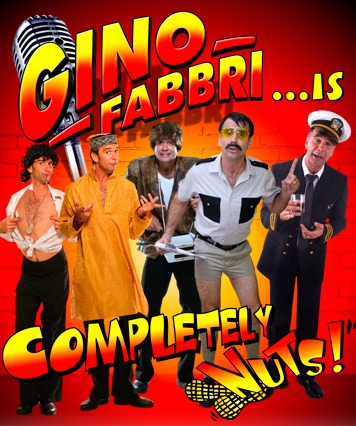 Laughter abounds and the spotlight falls squarely on ‘crazy’ as Gino Fabbri brings his laugh a minute comedy ‘Completely Nut’s to the Barnyard theatre. Described as a welcome anti-dote to deep thinking, Gino performs in the guise of numerous very different, over the top characters throughout the evening. Each delivers more rapid-fire one-liner laugh lines than your stomach can hold in a series of mini comedy sets, seeing life from vastly different and highly amusing perspectives. These include a self-deceiving Latin Lover , an over zealous, hip thrusting overly rule-bound traffic cop, a talentless pop-idol wannabe with parental and self-esteem issues, a wheeler-dealer Indian business-man and dubious social media expert and a tipsy air-line pilot . The multi-talented Fabbri, who is himself also a top drummer, includes 3 show-stopping finales in the show, taking his audience on a musical journey through the evolution of the most recognizable rock drum fills before turning classical music on its head like never seen before! Interspersed audio-visual inserts bring the house down as Fabbri’s offbeat, unhinged characters poke fun at our multi-cultural, multi-lingual melting pot society. So get committed - come walk the tightrope between sanity and madness and find out for yourself if Gino is indeed “nuttier than a pile of squirrel droppings”, in the full knowledge that one thing will always be certain : You’ll be none the wiser after seeing this show!